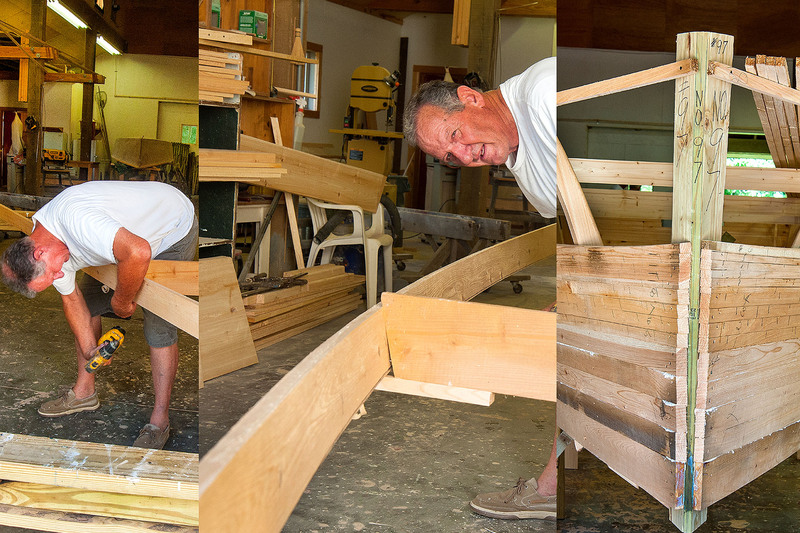 Preserving the history of rack-of-the-eye boat building is more than documenting a way of building boats; it also preserves a way of life. The Florence Mae, built by Harkers Island native Heber Guthrie for for the NC Coastal Heritage Association, is almost finished. 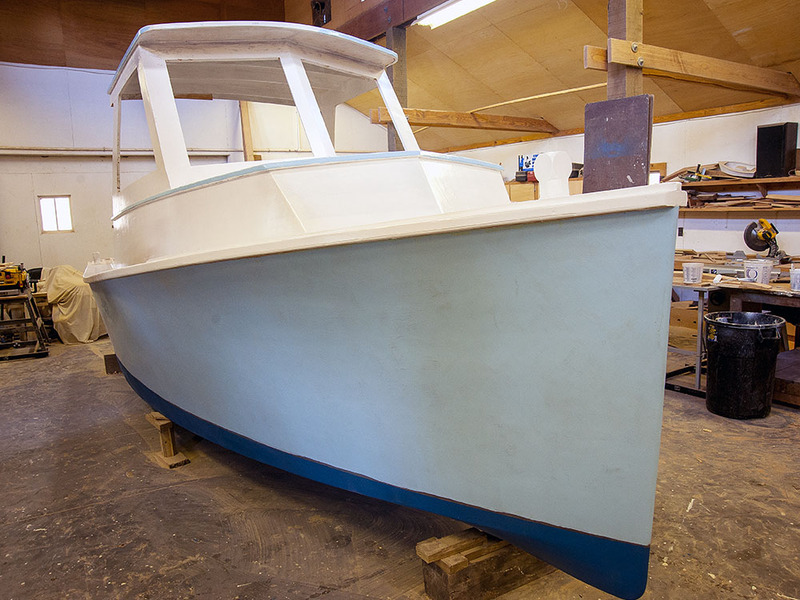 It will travel to schools and functions all across the state as a tangible example of rack-of-the-eye boatbuilding. One of the two main industries that set Harkers Island apart from the rest of the world has almost disappeared as a full time career for Down East natives. The Frances Mae will also travel the ICW annually from the Dismal Swamp to Southport with pre-scheduled stops at towns and villages along the way. Residents can board her and examine photo documentation of how she was constructed using methods passed down through centuries. For centuries, Down East fishermen have built boats in their yards. Aaron Styron from Cedar Island said that in the early 20th century, a boat was under construction in almost every yard around Core Sound. Over time, many fishermen discovered they preferred building fishing boats over fishing. A separate industry was born. Today, factory-made fiberglass vessels and the decline in commercial fishing have severely diminished an industry that once played a major role in defining the cultural heritage of the coast. To preserve both the art and technology of rack-of-the-eye boat building, NCCHA is sponsoring the construction of a Core Sound workboat to appear in parades, flotillas, and static displays for festivals and similar events. Not a replica or a museum piece, it is a 21 ft. work boat whose construction has included some of the oldest known rack-of-the-eye techniques. The only contemporary elements involved are glues and epoxy resins. The hull is strip planking. Slated for completion in early March, 2017, Heber Guthrie is building it in Marshallburg. Generous donations have made it possible for NCCHA to create this tangible record of coastal heritage. 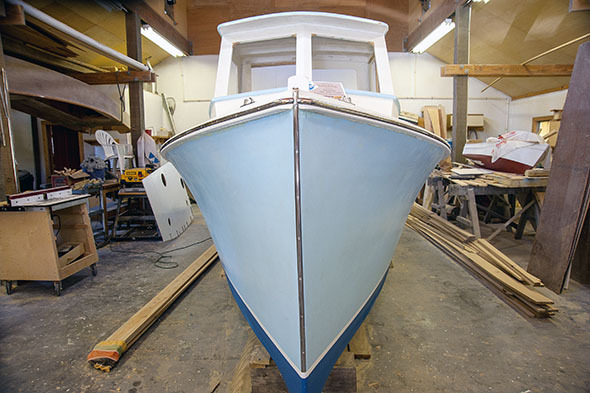 Though nearing completion, approximately $2,500 more must be raised before the boat can be launched. Please consider visiting the Donate page to help with a tax deductible gift. Recent gifts to this project: The Pamlico News has donated a Teleflex steering head for the Frances Mae. Dennis Chadwick donated the fuel intake port, Doug Cahoon donated the engine bracket, Rusty Daniels is providing labor to install the windows, and Barbara and Jim Pearson donated the fuel tank. Their names, along with the other donors, will go on the dedication plaque in the cabin . Construction of the Frances Mae has a red day marker to starboard. Learn more. Please visit bencaseyphotos.com.